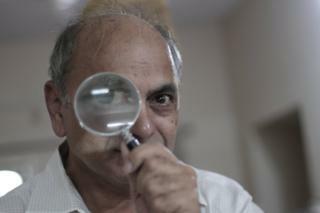 When Ganesh Devy, a former professor of English, embarked on a search for India's languages, he expected to walk into a graveyard, littered with dead and dying mother tongues. Instead, he says, he walked into a "dense forest of voices", a noisy Tower of Babel in one of the world's most populous nations. He found that the nomadic communities in the desert state of Rajasthan used a large number of words to describe the barren landscape, including ones for how man and animal separately experience the sandy nothingness. And that nomads - who were once branded "criminal tribes" by British rulers and now hawk maps for a living at Delhi's traffic crossings - spoke a "secret" language because of the stigma attached to their community. In a dozen villages on the western coast of Maharashtra, not far from the state capital Mumbai, he discovered people speaking an "outdated" form of Portuguese. A group of residents in the far-flung eastern archipelago of Andaman and Nicobar spoke in Karen, an ethnic language of Myanmar. And some Indians living in Gujarat even spoke in Japanese. Indians, he found, spoke some 125 foreign languages as their mother tongue. Dr Devy, an untrained linguist, is a soft-spoken and fiercely determined man. He taught English at a university in Gujarat for 16 years before moving to a remote village to start working with local tribespeople. He helped them access credit, run seed banks and healthcare projects. More importantly, he also published a journal in 11 tribal languages. Sources: Census of India, 2001, 1962, UNESCO, People's Linguistic Survey of India 2010. It was around this time Dr Devy had an epiphany about the power of language. In 1998, he carried 700 copies of his journal written in the local language to a dirt-poor tribal village. He left a basket for any villager who wanted to or could afford to pay 10 rupees (£0.11; $0.15) for a copy. At the end of the day, all the copies were gone. When he checked the basket, he found a large of number of currency notes - "grimy, crumpled, soggy" - left behind by the tribal villagers who had paid whatever they could afford from their paltry daily wages. "This must have been the first printed material they saw in their life in their own language. These were unlettered daily wage workers who had paid for something they could not even read. I realised this primordial pride and power of the language," Dr Devy told me. Seven years ago, he launched his ambitious People's Linguistic Survey of India (PLSI), which he called a "right-based movement for carrying out a nation-wide survey of Indian languages as people perceive them". Can this state overcome India's language divide? As the indefatigable language hunter turned 60, he undertook 300 journeys in 18 months across the length and breadth of India to search for more languages. He paid for his trips using money he earned by delivering lectures in universities and colleges. He travelled night and day, revisiting some states nearly 10 times, and religiously kept a diary. Dr Devy also forged a voluntary network of some 3,500 scholars, teachers, activists, bus drivers and nomads, who travelled to the remotest parts of the country. Among them was a driver of a bureaucrat's car in the eastern state of Orissa who kept a diary of the new words he heard during his extensive travels. The volunteers interviewed people and chronicled the history and geography of languages. They also asked locals to "draw their own maps" on the reach of their language. "People drew maps shaped like flowers, triangles, circles. These were maps of their imagination on the reach of their language," says Dr Devy. By 2011, the PLSI had recorded 780 languages, down from the 1,652 languages counted by the government in 1961. Thirty-nine of a planned 100 books carrying the findings of the organisation's survey have already been published; and some 35,000 pages of typed manuscripts are being vetted for publication. India has lost a few hundred languages because of lack of government patronage, dwindling number of speakers, poor primary education in local languages, and migration of tribespeople from their native villages. The death of a language is always a cultural tragedy, and marks the withering away of wisdom, fables, stories, games and music. Dr Devy says there are more pressing anxieties. He worries about the ruling Hindu nationalist BJP's efforts to impose Hindi all over India, which he calls a "direct attack on our linguistic plurality". He wonders how India's melting-pot megacities will deal with linguistic diversity in the face of chauvinistic politics. "I feel sad every time a language dies. But we have suffered heavier losses in other diversities - like varieties of fish and rice," he says, sitting in his home in Dharwad, a sleepy, historic town in Karnataka state. "Our languages have survived tenaciously. We are truly a linguistic democracy. To keep our democracy alive, we have to keep our languages alive."